Red Cross Canada Volunteer 1949-1959; Boy Scouts of Canada 16th “A” Humber West Pack 1951-1961; Girl Guides of Canada (10 Years); Associate Member 883 (Kelowna) Wing RCAF Association. Passed away peacefully on November 2, 2018, at the age of 91 years in Kelowna, BC. Wife of the late George W. Kerr for 60 loving years. Loving Mother of Judy (Terry) Sanderson, Langley, B.C; and Sue (Bob) Mapson, Kelowna, BC; Gramma to Kaileigh Kerr Mapson and Brianne Nicole Mapson; and Brookelyn Kerr Sanderson. Dear brother to Ernie (deceased) and Sister-in-law Audrey Reynolds (Richmond Hill, ON); dear sister and best friend Irene (deceased) and brother-in-law Lloyd Ness (deceased); and loving nieces and nephews Cathy (Don) Walker and sons Gordon (Vanessa) and Bryan Walker; niece Cori Ness (deceased); and nephew Walter Ness, son Kevin and daughter Britney of Hamilton, ON; and many Reynolds family nieces and nephews in Ontario. Lifelong friends of both Mom and Dad, Brian and Linda Watts of England, and many other special friends from Westway United Church, as well as so many others from Etobicoke and Toronto. Loving thanks to all of the extended family, friends and neighbors…you know who you are and how much you all meant to Mom. Special thanks to all the staff and caregivers at Chatsworth Retirement Residence, Kelowna, B.C. where Mom resided for the past five years. Thank you also to Dr. G. Chamberlain and staff for their care over the years. Mom will be lovingly remembered for her beautiful smile, devotion to family, willingness to volunteer and her love of celebrating any and all occasions. She will also be remembered for her strong faith and participation in many church activities and Bible study groups. The service for KERR, Gwendolyne Mary (nee Reynolds) is scheduled for Saturday, November 10, 2018 at 1:00 pm . Below you will find the map for the service location and the contact information should you have any questions. 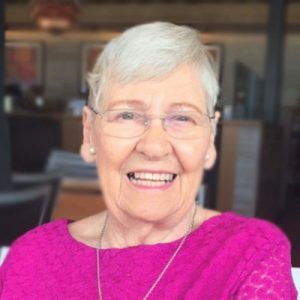 Gwen was part of our Bible study at Chartwell Chatsworth for approximately 4 years. She provided welcome input and added much joy to our gatherings each week. Gwen was very kind to us, giving us cards on major holidays and caring about each one she met along the way. We are thankful to have known her and feel your loss keenly. She was a wonderful woman and will remain forever in our hearts. Judy and Sue – I saw the obituary in The Star this morning, and it brought back many childhood memories growing up close to your family on Wincott Drive. Your mom was a very special lady!! I have made a donation to The Red Cross in her memory; my condolences to you both, and to your families. Fond memories of Gwen and George at 211th Toronto Cubs and Scouts.